Over 120 young people from four local schools visited the Keepmoat Stadium to take part in workshops to tackle homophobia, biphobia & transphobia. Club Doncaster were the latest sporting partner to host an education event aimed at tackling homophobic, biphobic & transphobic (HBT) bullying with Show Racism the Red Card. The events, which also feature anti-racism workshops, are designed to help raise awareness of HBT bullying and support young people to consider their role in preventing it and promoting equality in school. Year 5 & 6 pupils from Rosedale Primary, Branton St Wilfrids, Our Lady Mount Carmel and Bentley High Street took part in a carousel of workshops and activities focusing on the forms that prejudice can take and empowering young people to stand up to bullying & inequality. The event was part of a project funded by the Department for Education and the Government Equalities Office which aims to reduce instances of HBT bullying in schools. Doncaster Council also sponsored this event; the council are long time supporters of the SRtRC campaign. In addition to anti-racism workshops and workshops to tackle homophobia, biphobia and transphobia which were delivered by Andrew Huntley-Roe of Doncaster Pride, staff from Club Doncaster also led a series of ground tours; giving the young people behind the scenes access to the Keepmoat Stadium and its facilities. During the lunch break, the young people watched SRtRC’s educational film Homophobia; Let’s Tackle It, which can be used in conjunction with a specially designed education pack for use in the classroom. Following the break, there was a screening of SRtRC’s anti-racism education film which features a range of high-profile role models from the world of football who, alongside young people, discuss their experiences of racism & prejudice. Throughout the day the young people were encouraged to think of questions about the issues being discussed that they could put to a panel of special guests via an interactive Q + A session. The panel for the Q + A session was made of Doncaster Rovers centre back and SRtRC patron Andy Bulter, who was joined by fellow first teamers Cedric Evina and Billy Whitehouse. The Rovers players were joined by Doncaster Rugby League scrum half Jordie Hedges and Doncaster Pride’s Andrew Huntley-Roe to take questions from the young people present. The players spoke about their personal experiences of racism and bullying and the experiences of friends and team mates; stating that there was no place for bullying within sport, schools and local communities. The young people asked some very mature and insightful questions, and prizes were awarded for the panel’s favourite three questions of the day. The event closed with an autograph signing session, with all 120 young people keen to get a memento of the day. 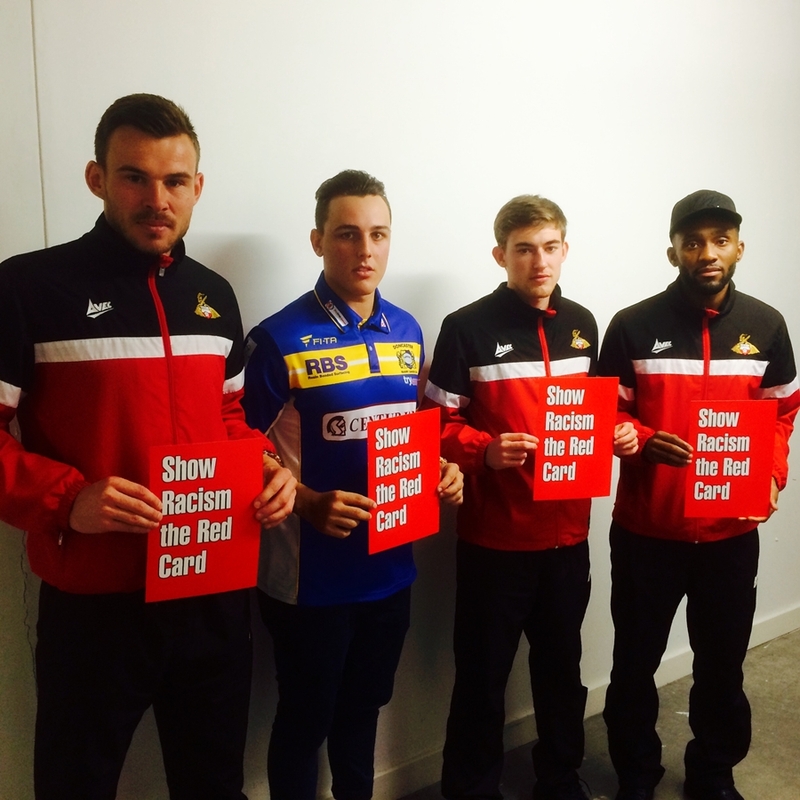 Show Racism the Red Card would like to thank everyone at Doncaster Rovers and Club Doncaster, especially Gareth Cook for his help in organising the event. Big thanks also to Doncaster Council for their ongoing support. Special thanks go to Andy Butler, Cedric Evina, Billy Whitehouse and Jordie Hedges for giving up their time to attend the event, and thanks also go to the brilliant Andrew Huntley-Roe of Doncaster Pride for his continued help and support for the campaign.